Spring Mini Sessions are live! 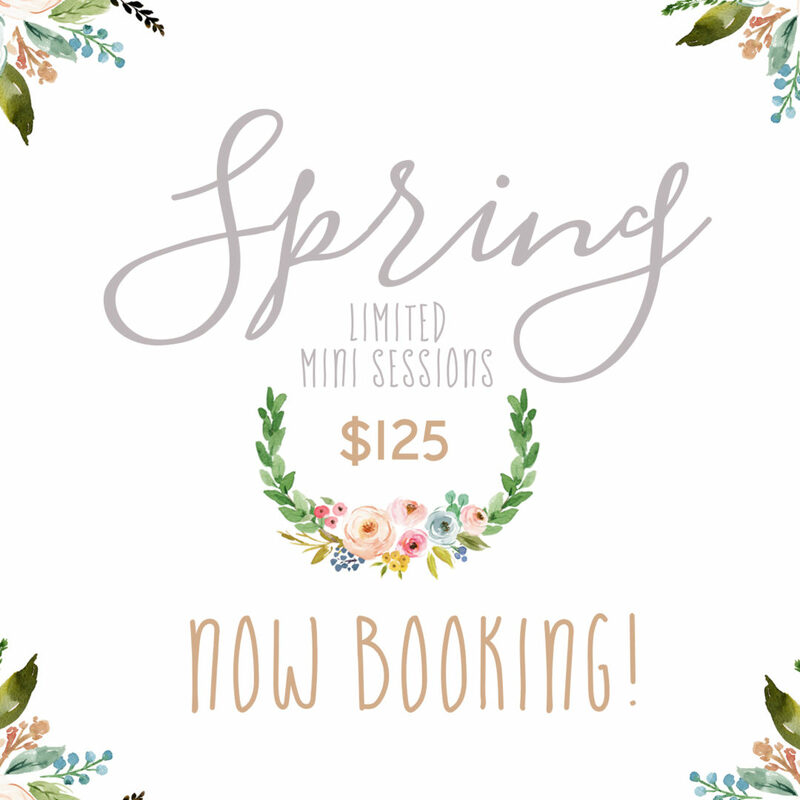 For the first time ever, and by popular demand, I am offering Spring Mini Sessions!! These spots are limited and may book quickly. The openings are during May 5th, 6th and 12th starting at 5pm. They will run $125 per session slot and include an online gallery of 10 high-resolution digital images for downloading as well as a print release. These mini sessions are condensed photo sessions - so perfect if you are wanting a few specific family captures in the springtime. Each session will be about 20 minutes in duration and held at a local and beautiful outdoor area - Susquehanna State Park. A $25 + tax retainer is due to secure your session time slot and the remaining balance of $100 + tax would be due at your session. Retainers are non-refundable. To secure your time slot, a $25 non-refundable deposit is required. The remaining amount is due at the start of your session. Mini sessions are for families, couples, children or individuals who want a simple portrait session. How often do you do mini sessions? This will be the first time I am offering mini sessions in all the years I have been in business! I do have hopes to offer something like this in the fall. I’ll be happy to reschedule the entire day of sessions if its raining or too cold. If this happens, you will be notified in advance of the makeup date. If you are unable to make it to the makeup date, then I would plan to book your mini session for a day that works for you. You will receive a link to download all of your images as well as a Limited Print Release to use when you print your pictures. A Limited Print Release allows you to download all of the pictures and print them at your preferred print location. However, Amanda Steinbacher Photography will retain the full Copyrights which means you are not permitted to alter the images, sell them, or submit them to any publications or contests without prior written approval from Amanda Steinbacher Photography. Where do you suggest we print our photos? You may also order prints and products directly through your online gallery. Have Questions and would like to chat before booking? Head on over to my Contact page and shoot me a message! I came to your site looking for a Williamsport PA Newborn photographer and then saw your info about spring mini sessions. What a deal! Oh wow what a great deal for your Williamsport PA clients!! I am going to send a message to inquire about you being the Newborn Photographer for my cousin’s baby- I’m a big fan of your work! I wish I was in Williamsport PA this is such a great deal for family photography! 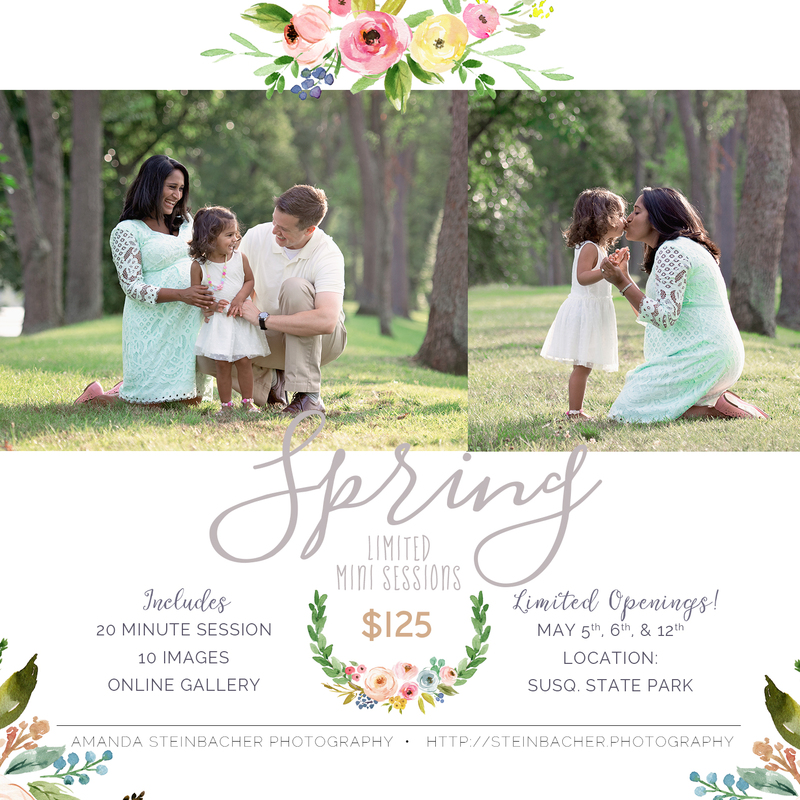 I love that my favorite newborn photographer is offering these Spring mini sessions. This Williamsport location is beautiful. Perfect for these sessions. I love you Williamsport milestone sessions so much, that I know these spring minis will be amazing! I am sure as a photographer that you are so happy for spring to finally be here!